If you ever wondered about how things are made here at MidNite Solar, checkout this 1 hour video on what we do. Come check out Our MidNite Solar Forums. Talk about our new PowerTime videos. How about our Classic local app? Or any of our other popular products! Discuss them here with other users and us, Including Ryan, Roy Butler (Resident Wind guru), Sue and Kyle the moderator. Ryan and Roy are professional Solar and wind installers, with over 40 years of experience in alternative energy. It is nice to be able to ask questions about products and actually get a person that knows the answers from personal experience. Check out the MidNite forums here. 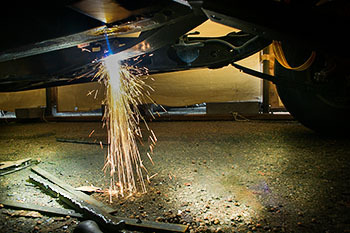 MidNite Solar is an innovative manufacturing company that started by making high quality, cost effective AC and DC disconnect boxes for the alternative energy industry. Now, MidNite produces a wide range of alternative energy products. 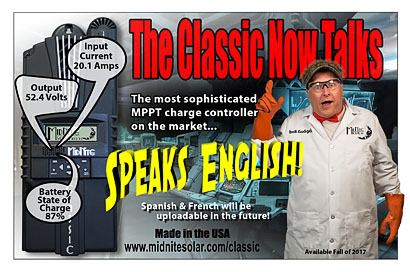 MidNite's Classic series of Maximum Power Point Tracking (MPPT) charge controllers are the most sophisticated, full featured controllers on the market as well as being the only ETL listed controllers designed to work with Solar, Wind, and Micro Hydro Electric systems. MidNite offers a full line of pre-wired, battery based systems for standalone off grid, battery based grid tie, as well as AC coupled battery backup installations. MidNite features SMA, Schneider / Xantrex and Magnum Energy Inverters in our pre-wired systems, providing a wide range of solutions for residential and commercial projects. 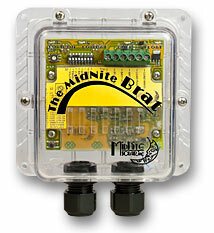 MidNite Solar is the largest manufacturer of combiner boxes in North America. The new line of Disconnecting Combiner boxes are another industry first, meeting all of the new NEC requirements for this class of equipment. MidNite's full range of Surge Protection Devices (SPD) offer the highest levels of protection from lightning and power line surges. They’re very competitively priced. This is just a few of the MidNite Solar products that are designed and manufactured in the Arlington Washington facility and installed in alternative energy systems around the world! Click here to access our online customer support center. For more support options click here. MidNite is starting an exciting project, an electric car using lithium batteries designed by MidNite for our revolutionary new Inverter system the B17. This is the first in a series of reports on this project. The Classic is now available with voice. Our first ad featuring voice has BoB Gudgel, the lead engineer of the Classic, doing the introductions. This past SPI show the AltE Store created a couple videos showcasing a few of MidNite's future products, the MNB17-5 and a Grid-Tie Inverter. For a sneak preview take a look. 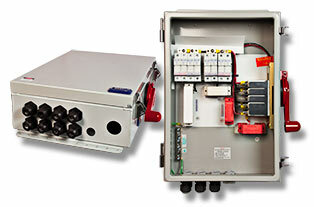 The KID is the most versatile medium sized charge controller on the market, ideal for small renewable energy systems. The KID allows for true input paralleling. As your power needs grow, add more modules to the array and a second KID. This will give twice the power from a single array. The web based My MidNite is being updated to a newer version. The older version will continue to work until February 29, 2016. Customers will need to update the firmware in the Classic to use the new version of My MidNite. The URL for the new version of My MidNite is at https://mymidnite2.com and all the existing accounts from the previous version will already be in place and should work just like the old one. If you have any questions on the new My MidNite please reach out to our support department. You can find the contact info at MidNite Support. The BRAT - Check it out! 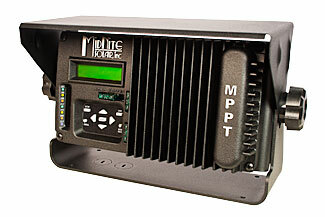 The Classic MPPT Charge Controller substantially increases the flexibility, features and range currently found on MPPT controllers. The Classic is the only MPPT controller that has Arc Fault Detection, making this controller the safest controller available. With the Classic 150 ranging up to 96 amps, the Classic 200, 79 amps and the Classic 250, 63 amps, why would you need any other controller? Standard Classic - Has all features: Arc Fault, Ground Fault, Free web monitoring, Graphics panel, Solar, Hydro and Wind Modes. Classic-SL's - Simplified version of the standard Classic No Arc Fault, Solar Mode Only, No Ethernet capabilities, Ground Fault included. Graphics Panel and Simplified Menu. 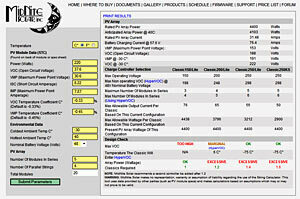 These are great tools to help configure the Classic and MNKID with your system. 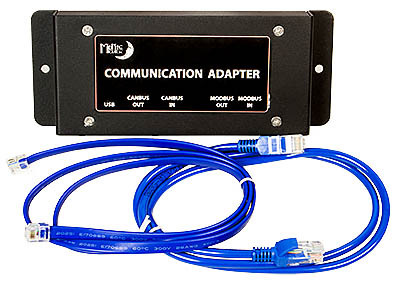 MidNite's MNSICOMM SMA Communications Adapter converts the Classics Modbus into Canbus for the SMA giving the SMA system full control of the Classic. 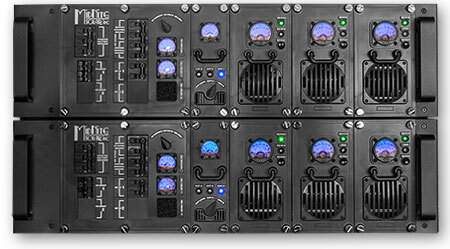 The MNSICOMM allows the Sunny Island to control up to 4 of the Classic charge controllers. NEC690.12 is being enforced faster than any NEC section in history. Massachusetts is enforcing 690.12, Rapid Shutdown. Sixteen states are adopting NEC2014 by July 1, 2014. 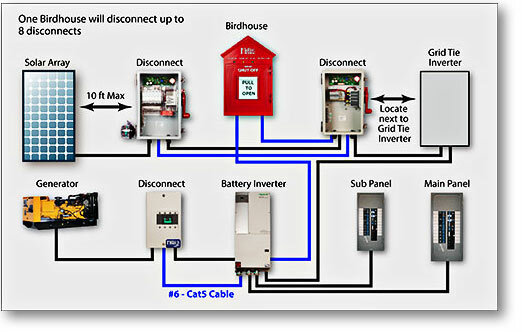 The MidNite Solar Birdhouse and associated shut off boxes, enclosures and battery disconnects are the first listed solution in the solar industry. The Birdhouse is now UL 1741 listed. Disconnecting Combiners designed specifically for the new dual channel MPPT on transformer-less inverters like the SMA Sunny Boy TL series or Power One for example. Specifically designed to work with our Rapid Shutdown system (NEC 690.12) and the SMA TL series with Back Up power where a contactor based will not work. PROGRAM YOUR OUTBACK AND CLASSIC AS WELL AS MONITOR IT! MidNite's Classic series of MPPT Charge Controllers features HyperVOC, a non-operative VOC safety zone over and above the maximum input voltage. "Just now took the time to try the Sizer. WOW, very fast to enter data ... works great. The best string sizer that I've seen. - Thanks! Vic"
Check out what others are saying about MidNite Solar.